Most social media user are familiar with Facebook, Twitter and also the newly released Google+. LinkedIn is a different type of social network. LinkedIn focuses on business, networking connections and giving professionals a place to showcase their resumes, skills and self on the Internet. This site has quickly become one of the quickest ways for a person to show who they are why they are worthy to potential employers without even submitting an application or asking for an interview. LinkedIn currently boasts over 135 million users in over 200 countries. If you are looking for a way to network and connect professionally, our guide to getting started with LinkedIn will get you on your way. From there, you can create a new account from its home page. LinkedIn will begin creating your profile. 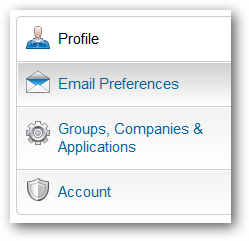 It will now walk you through creating your profile on the site which is imperative to making LinkedIn worth your time. 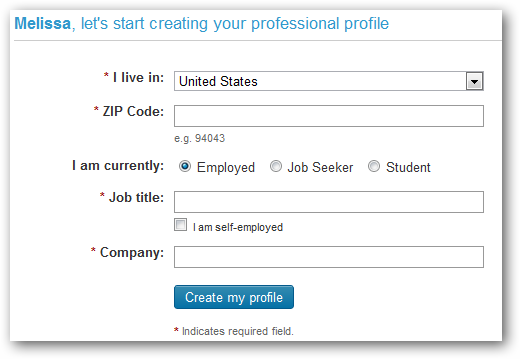 Choose which country you live, your zip code and enter the details for your first job to add. Click “Create my profile” to continue. LinkedIn will ask to login to your e-mail to try and connect you with family, friends, co-workers and others already using LinkedIn. You can either do this now or do it later. Click “Continue” or “Skip this step” depending on what you want to do at the moment. Next, you will need to confirm your e-mail address. 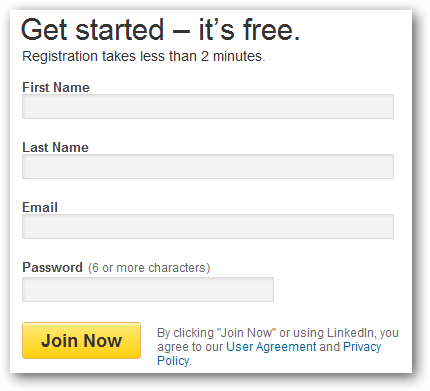 So, login to your e-mail and click the link you received from LinkedIn. 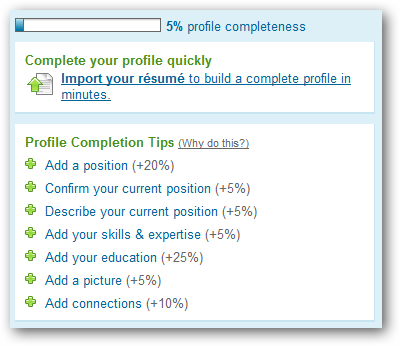 Once confirmed, you can continue building your LinkedIn profile. Now, your basic LinkedIn profile is ready to share, you can opt to share the link to it on Facebook and Twitter or you can opt to skip the step until you complete it. LinkedIn will present you with options for its basic or premium service. Depending on what you want to do with your LinkedIn profile, you can choose a premium plan for a fee or continue on with the basic profile. For beginners to LinkedIn, the basic account is fine to get started with until you begin to learn how to use it and your network connections grow. After deciding between a basic or premium account with LinkedIn, the site will give you a basic checklist to begin building your profile. At the top of the screen, you can begin adding jobs to branch out on LinkedIn. First, let’s take a look at the LinkedIn settings. 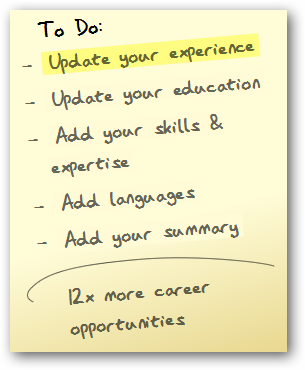 From here, at any time, you can change how you deal with LinkedIn as well as how it interacts with you. 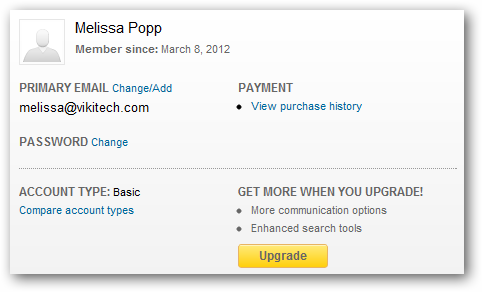 You can also choose to upgrade your account at anytime from the Settings page. On the left hand side of the screen, you will see the settings categories. This area will allow you to control all aspects of your profile, such as activity broadcasts, photo visibility and Twitter settings. This is where you will control the type of e-mails you receive from LinkedIn and what type of e-mails you receive. LinkedIn sends you e-mails to let you know about everything from news for the site to partner and research e-mails. You can also receive e-mails from other people wishing to network with you on the site. This area will let you control how your groups and companies display and work on LinkedIn. It also lets you add Applications that enhance your profile as well as work with your privacy controls. The account area allows you to close your account, upgrade your account as well as change how your account is shown to other users. Now that you have an idea of the behind the scenes areas of LinkedIn, let’s work on building your profile and getting scene on the site. 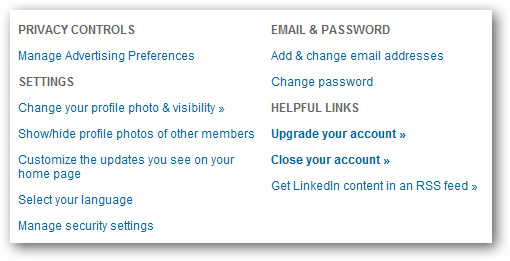 At the top of your LinkedIn site, you will always see the toolbar to interact with the different areas. You will also see a search box so that you can search for other users, companies and networking opportunities. In order to begin building your profile, you want to start by adding pertinent information about yourself, your skills and your experience. It is important to keep in mind that you want potential employers and connections to see just what you are worth and by adding information, you are giving them a complete picture of who you are as a professional. When you begin working on your profile, to the right of it you will see areas LinkedIn believes will increase your visibility along with how much the site believes will help build yourself up on the site. 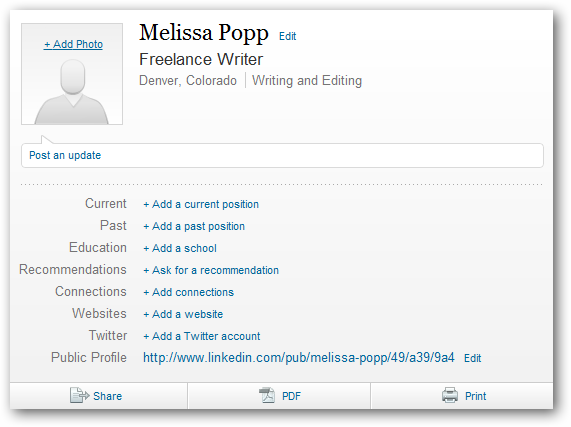 You can then click on each link, add information and build your profile on LinkedIn from the ground up. LinkedIn makes it easy for you to show just who you are online quickly without having to do it on your own. Our guide will help you get started with LinkedIn, but there is so much more to the site than just what you begin to do with your profile. Take the time to truly learn just what LinkedIn is all about and read the success stories that could be the way your time on the site plays out. Is LinkedIn a good way to network? LinkedIn has proven to be a good way to network not just with companies and potential employers but also with those you have worked for in the past. By using what you have done with what you strive to do, LinkedIn has captured a type of social networker that other sites, such as Google+, Facebook and Twitter, cannot even come close to understanding. Professionals, up and comers and more flock to LinkedIn and build themselves up to network and connect in ways social networking never saw coming. 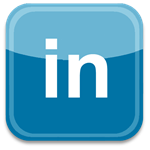 If you have not seen what LinkedIn can do for you, create a profile today and see what the site is all about and if it is right for you.